Skimming just above the tree tops, a predator zips along at 120 miles per hour. It crests the rim of a deep forested valley and drops down into the gully, following the contour of the valley floor, maintaining concealment as it speeds toward the intended target. 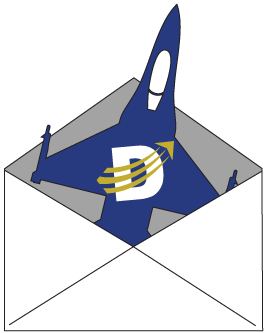 It arrives on station, slipping in behind a small crop of trees, hovering like a hummingbird. The only visible evidence of its presence is a small radar dome on top of its rotors peeking over the tree tops allowing it to see its target without being detected. It quickly identifies the unsuspecting objective lumbering ahead. In a flash, the aircraft pops up above the trees and unleashes a barrage of rocket fire on the enemy convoy. 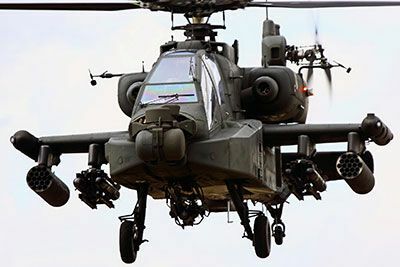 This bird of prey is the AH-64 Apache helicopter, the U.S. Army’s heavily armed and extremely agile primary attack helicopter. This highly stable aerial delivery platform is designed to bring the fight to the enemy during the day, night, and in adverse weather conditions anywhere around the world. The Apache can track up to 128 targets, and engage up to 16 at once, due to its powerful AN/APG-78 Longbow Fire Control Radar. This twin-engine, four bladed multi-mission attack helicopter is a formidable weapon on any battlefield. 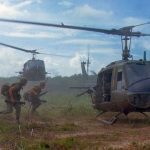 Originally accepted into service by the U.S. Army to begin training pilots in January 1984, the first Apache unit did not become operational until April 1986. The aircraft is operated by a two-man crew -the pilot sits in the rear cockpit and the co-pilot/gunner sits in front. Both airmen have the ability to fly the helicopter and fire weapons. The avionics and optics of the Apache are intimidating features. The AH-64 can monitor troop positions and movements well outside the audible range of enemy troops. The AH-64 can see the enemy up-close, day or night, even when the enemy does not know that it is in the area. It’s capable of firing air-to-surface “fire and forget” missiles from up to 7.5 miles away. 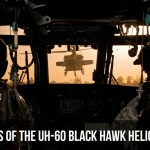 Chances are, if you hear the AH-64’s rotors chopping through the air and it’s looking for you, it’s already too late. 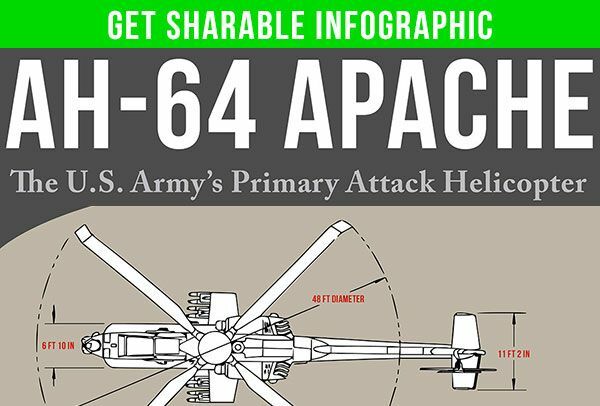 Performance – The Apache has a maximum speed of 186 mph, a combat radius of 300 mi, a service ceiling of 21,000 ft, and a rate of climb of 2,500 ft/min. Armament – Armed with a 30mm M230 chain gun with 1,200 rounds, and 4 hardpoints to carry AGM-114 Hellfire missiles or Hydra 70mm air-to-ground rockets. The Apache also has stations on each wingtip for AIM-92 Stinger air-to-air twin missile packs. State of the Art Optics – As part of the target acquisition designation sight/pilot night vision sensor, the Apache has 3 different target acquisition sensors. Day TV lets the pilot see images during the day and low light levels in black and white. TADS FLIR provides thermal images, real world and magnified, during day, night, or in adverse weather. DVO views real world in full color and can magnify images during daylight and dusk conditions. Helmet Tracking – Integrated Helmet and Display Sighting System (IHADSS) not only provides impact protection but also displays flight and target information and controls weapons systems. The 30mm cannon tracks with the pilot’s head movement, directing the weapon to wherever the pilot looks. Survivability – The AH-64 has redundant control systems and can withstand damage from rounds up to 23mm in critical areas to ensure combat survivability. The cockpit contains armor and pressure wave shielding that surrounds the pilot. 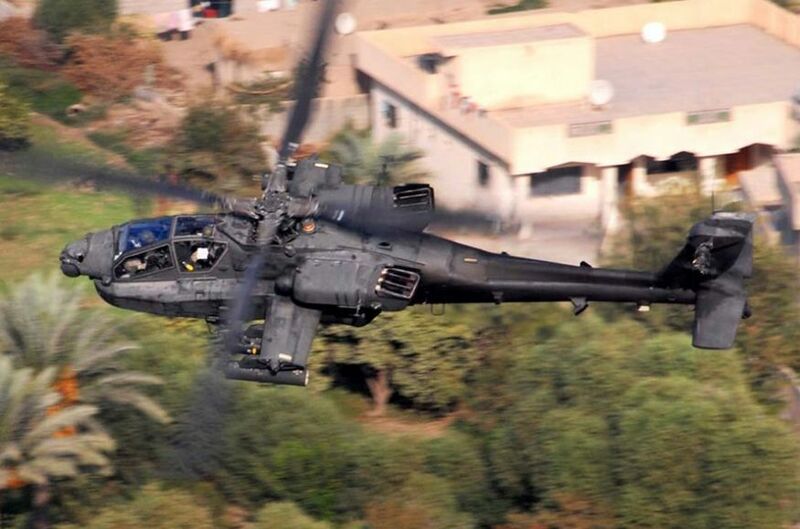 Since beginning production, over 2,000 AH-64s have been produced. 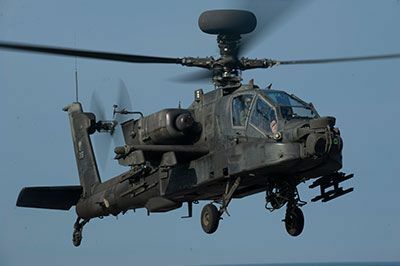 Though the U.S. Army is the primary operator of the Apache, it is also in service in thirteen other countries that include Egypt, Greece, Israel, Saudi Arabia, United Arab Emirates, United Kingdom and more. The Apache has seen incremental technology updates and insertions at regular intervals to ensure it remains the most capable, multi-role attack helicopter in the world. 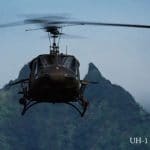 With companies like Duotech that have capabilities to extend the life of the AH-64 by repairing its aging and obsolete systems, this multi-role attack helicopter will remain in service for countries around the world for years to come.